Tommy Floyd Jr. (left) and James Gibbons (right) of South Florence High School won the 2018 Mossy Oak Fishing Bassmaster High School Classic last weekend at Lake Keowee. Tommy Floyd Jr. and James Gibbons of South Florence High School won the Mossy Oak Fishing Bassmaster High School Classic this past weekend. 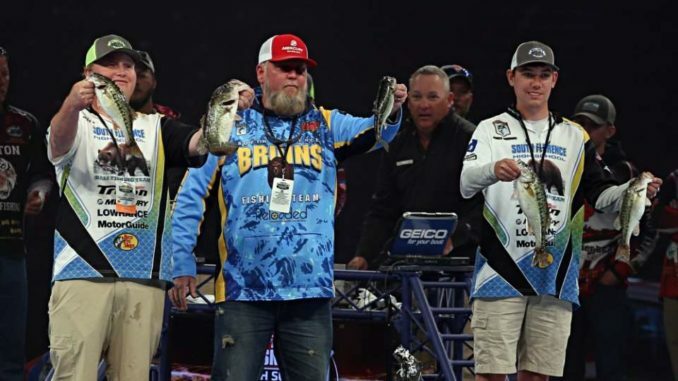 While the 2018 Bassmaster Classic was taking place on Lake Hartwell, high school anglers from all over the country were competing in their own Classic on nearby Lake Keowee, and the next generation of tournament anglers weighed in at the Bon Secours Wellness Arena on the same stage as the big boys did hours later. Floyd and Gibbons took top honors after weighing in a five fish limit weighing 8-pounds, 13-ounces. And none of them came easy. 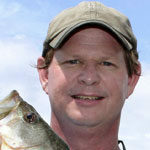 “We fished shallow early in the day, but we didn’t find any there, so we decided to fish deep. We hit three spots today. We rotated them all through the day,” said Floyd. After locating those three spots with their electronics by looking for sunken rock boulders in about 35 feet of water, the two anglers soon realized that persistence would be the key to putting fish in the boat. “You had to let the fish eat it. You had to let them swim around with it for a long time because they were short-striking it. We could throw back to a fish three times and he would bite it each time,” said Gibbons. The same two anglers teamed up to win the Costa Bassmaster High School National Championship last summer.